Serving turkey as the centerpiece to a meal is an American tradition that dates to colonial times. Wild turkey was a plentiful game source in early America, hatching in the spring and reaching table weight by the first crisp days of autumn, making wild turkey a perfect choice as the centerpiece of Thanksgiving celebrations. Turkeys continue to hold a prominent place in our celebrations and family feasts. As America became more urban, the modern commercial turkey industry was developed to ensure a turkey on every table. 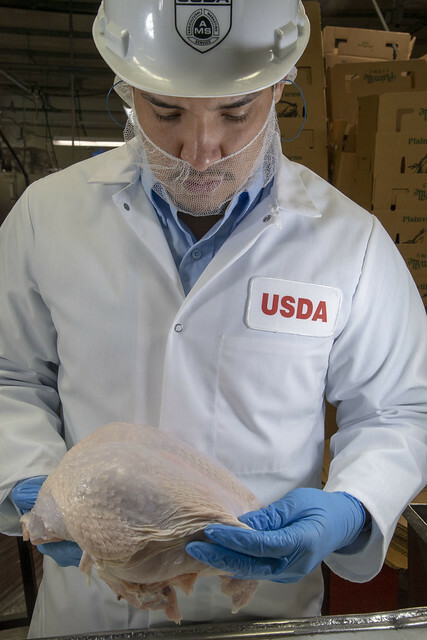 Since the late 1940s, USDA's Agricultural Marketing Service has been providing consumer assurance through its quality grading service with the "USDA Grade A" shield seen on turkeys in grocery stores across the country. The "USDA Grade A" shield conveys confidence that the turkey you feed your family meets the highest standards of quality. Working with their industry partners, USDA graders make sure that only the best birds—those free from defects such as tears, bruises, or broken bones—receive the "USDA Grade A" shield. Companies request this quality assessment service from Agricultural Marketing Service to reinforce their commitment to quality and communicate it to their customers. USDA grading services support the domestic and international marketing of a variety of American agricultural products in addition to turkey – such as beef, lamb, veal, chicken, and shell eggs. As processing gears up to meet demand for the holiday season, USDA graders work around the clock providing continuous oversight throughout the production process, ensuring strict adherence to USDA’s quality standards. Thanksgiving makes us thankful not only for the farmers who grow our food, but also for the many other hard-working people who contribute to bringing the best of our Nation’s agricultural bounty from the farm to the Thanksgiving table. Look for a USDA Grade A turkey as a perfect centerpiece for your meal this Thanksgiving. So...please list the sources for the ongoing outbreak of antibiotic resistent salmonella so the public can better protect themselves against unethical food producers. Or are you now tasked with protecting profit over health?